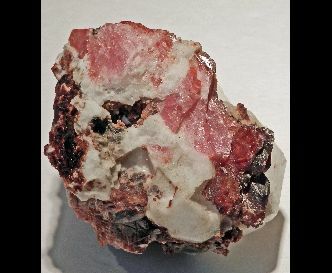 A nice hand sized small cabinet specimen of the hard to get Rhodochrosite from Mount St. Hilaire Quarry. It has the typical hot pink as well as the darker burgundy pink crystals in macro and micro. Also has some strong bright green fluorescence under SW and aqua blue fluorescence under LW in the pocket. [the genthelvite] NB Rhodos from MSH are usually micros, these xls range from well formed .5 cm xls to large platy crystals of 1.3 cms. It is a truly unique piece.